Download Percy Jackson and the Olympians: The Lightning Thief in Digital HD from the iTunes store. 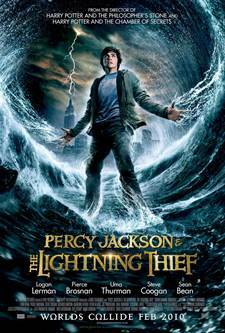 Percy Jackson and the Olympians: The Lightning Thief images are © Warner Bros.. All Rights Reserved. After it was established that Harry Potter was wildly popular, one would speculate someone was dispatched to the children's section of the bookstore to see what else they could option. Certainly, the formula is pretty well established: take a popular children's series and give it the deluxe CGI treatment and consider that your casting is probably the second biggest decision you can make. A good director can make a big difference too; and whether or not you like Chris Columbus, his experience with the first two Potter movies probably makes him as experienced in this as you can get. However, the formula isn't always successful. It appears that The Chronicles of Narnia is done at only two movies (Disney dropped the property but another studio picked it up). It looks as if we are never going to get the second two His Dark Materials books -- the first being the Golden Compass; but that is not going to stop anyone from trying. In this case, they are working off of Rick Riordan's Olympian novels. Perhaps the theory was that The Chronicles of Narnia and The Golden Compass, while a lot like Harry Potter, were possibly not enough like Harry Potter. To be certain Percy Jackson is a great deal like Harry Potter; there is a trio of kids -- two boys (best friends), and a girl. They belong to a magical world that Percy doesn't know about, and he leads a soul-crushing mundane life in the real world, while the other two come from that world and do fit in. There is a school where they all hang out. The main character becomes a hero of the school and has fantastical journeys...and so on. Apparently, the book's protagonist was 12, but the decision was made to make the characters older (either for reasons of violence and green-screen or because it is more marketable this way). It is a lot like Harry Potter, and like Harry Potter, it's decent. The basic story is this. Our world is inhabited by the Greek gods. The gods have kids, but are forbidden to interact with them; so these demigods lead lives on the edge of this invisible world. There is a camp for them where they train to become heroes, and there are well-disguised fantastical creatures around, and sometimes they get to go on quests or adventures. In this case, Jackson, the son of Poseidon, is accused by Zeus of stealing Zeus's lightning bolt -- a super powerful weapon. He has several days to return the bolt or else the gods will go to war -- which would be earth shatteringly bad. Percy Jackson doesn't know any of this. He goes to school with his best friend, Grover, and is unhappy with his life. His single mom lives with a nasty, quasi-abusive man, who smells bad, and this later turns out to be a plot point. When forces come after Percy looking for the lightning bolt, he is moved to "The camp" where he learns his true parentage and that he is in great danger. From this point, quests ensue. So how is it? Well, it is pretty good. Both the special effects and the actors are decent. 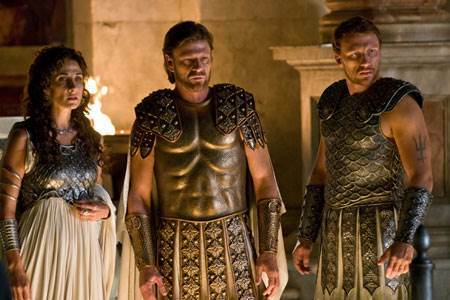 The updated Greek myths are all reasonably interesting, and if you remember your schooling, you can make an educated guess as to what is going on before the characters do. There are all kinds of weaknesses, but ultimately, you have to remember you are watching young-adult fiction on the screen. I think if you can get past that, you have a winner. The casting is pretty good. Logan Lerman has to carry most of the weight as Percy, and he does a reasonably good job of it. I felt his side kick, Brandon Jackson who plays his best friend Grover, was more show-stealing as the comic relief. Alexandra Daddario plays Annabeth, daughter of Athena (who never had any daughters, but I guess fooled around in the 90's) is believable but doesn't get much to do. Some bigger names put in appearances as either Greek gods or famous monsters. Uma Therman's Medusa is worth a look. There are several more books in the series, and apparently it is a popular one; so if this does well, we might see a few more. I would hope so because I liked the Chronicles of Narnia movies, and I didn't mind The Golden Compass. My inner 12-year old hopes they keep making these. Percy Jackson and the Olympians: The Lightning Thief images © Warner Bros.. All Rights Reserved.